Does anyone know if there is a significance to the belt buckle he is wearing in this picture? Cool pic, very unpretentious -- I feel John would've approved. 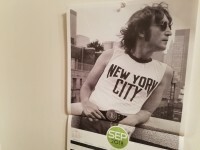 I know this hasn't been posted on in quite a while, but I have some Lennon photos that I'd love to share! This is one of my favorite Lennon photos. 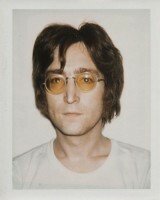 It's a polaroid from 1971, and it's from the photo sessions for the cover of Imagine . He looks sharp and tender at the same time.